To test if the turkey crown is cooked, pierce the thickest part with a long clean skewer or knitting needle. If the juices run clear, it’s ready. If it’s a little pink, then return it to the oven and cook it a little longer. I prefer to use a free-range or organic bird for this special occasion. 1. Preheat the oven to 190°C (375°F/gas mark 5). 2. To make the stuffing, heat a frying pan and melt the butter. Add the onion and sage and cook for a few minutes, until softened but not coloured. Add the toasted pine nuts, then stir in the breadcrumbs, mixing well to combine. Season to taste. Wrap the stuffing in buttered tin foil and mould into a large sausage shape, then chill until needed. 3. Next, prepare the turkey crown. Cream the butter until very soft, then add the crushed garlic, orange rind, parsley and thyme. Beat well until thoroughly blended. Gently loosen the neck flap away from the turkey breast and pack the flavoured butter right under the skin – this is best done using gloves on your hands. Rub well into the flesh of the turkey, then re-cover the skin and secure with a small skewer or sew with fine twine. Finally, cover the top of the crown with the rashers. 4. Place the turkey crown in the oven and calculate your time – it needs 20 minutes per 450g (1lb) plus 20 minutes, so a 5kg (11lb) crown will take 4 hours and you’ll need to put the stuffing in for the last half an hour. The turkey crown will cook much quicker than a whole turkey, so make sure to keep basting it. You can cover it with foil if it’s browning too quickly. When cooked, cover with foil to rest for 20 minutes and keep warm. 5. To make the gravy, skim all the fat from the cooking juices, then pour off all but 3 tablespoons of the juices from the roasting tin. Stir the flour into the pan residue and cook on the hob, stirring over a low heat until golden. Gradually pour in the stock, stirring all the time. Bring to the boil and let it bubble for 2–3 minutes, until thickened. Season to taste and keep warm. 6. To serve, carve the turkey crown into slices and arrange on warmed plates with the slices of cooked stuffing, glazed ham, Brussels sprout, red onion and bacon crumble, warm wild rice salad with sour cranberry sauce and the roasted carrots with garlic and parsley. Pour the gravy into a warmed gravy jug and hand around separately. Thank heaven for Neven! This definitive cookbook will be a lifesaver in every family’s kitchen. Our families are the most important people in our lives, so when it comes to mealtimes we want to give them the best we can. 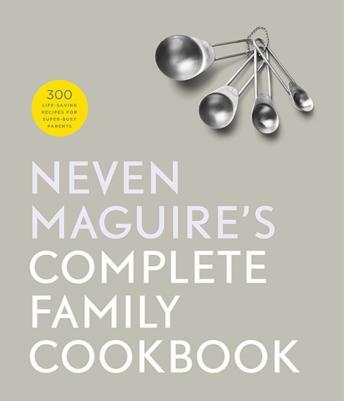 This new definitive collection from Neven Maguire gives you all the inspiration and help you’ll need to get more of the good stuff into your family’s diet and make homemade food the heart of your home. The book also includes lots of tips on how to wean the family off processed food for meal and snack times, how to plan for large family gatherings, how to cut down on food waste and how to bake the perfect celebration cake. Neven Maguire’s Complete Family Cookbook is published by Gill Books and available to buy in all good book stores and online at www.gillbooks.ie/cookery.